One of the most important goals of every LearnDash site is to keep the users engaged with the content. That’s why, analyzing your user activity and finding the inactive students is a great way to measure the performance of your learning system and you students. Additionally, active users often bring more users, or generate more revenue through repeat purchases. One of the most important goals of every eLearning website is to keep the students engaged with the content. 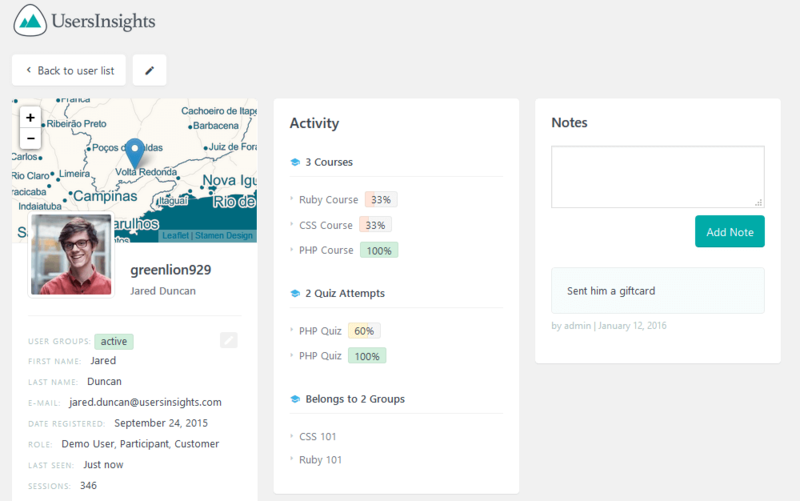 Users Insights comes with a LearnDash module that can help you analyze your student activity. You can use various filters, such as segmenting by last activity date or number of courses in progress. In order to have these filters available, just make sure to activate the LearnDash module under Users Insights > Modules. Let’s start with the basics. One of the most basic examples of the LearnDash reports is regarding inactive users. We may define user activity based on the “last seen” (session) or the “last activity” (LearnDash pages only) filters. These filters work with different data, and will probably give you different results. In case you are wondering, it’s also possible to extend your search to specific dates, or even bigger periods rather than just a month. For example, you can filter the user list to show only the students, who haven’t logged in after 1st Jan 2018. But if you have a bigger site with a blog or store, the last seen filter may not get you the information you need. For that, you can use the LearnDash user filter for last activity. In this way only the actual course-related activity is taken into account, such as lessons and topics watched or quizzes finished. 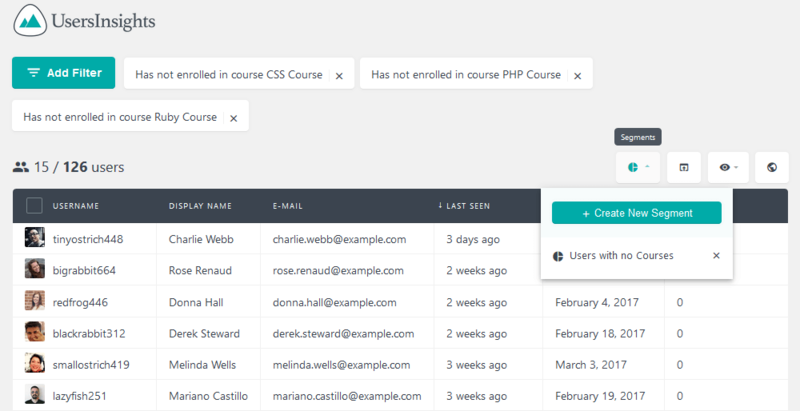 Another important factor in a LearnDash site is how many users aren’t enrolled in any courses, or in a specific course. This information gives you an insight of how many registered WordPress users you have, that haven’t taken particular courses. 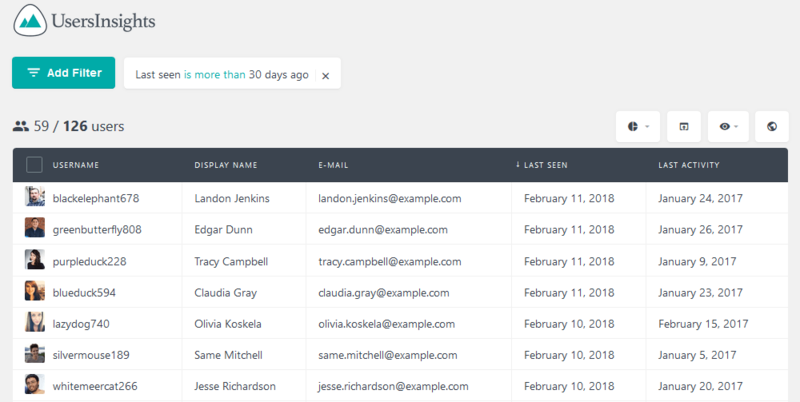 This may be caused by different factors, and you’re able to export this user list so you can interact with them to find out more. One way to find your inactive students when it comes to course activity, is by using the number of courses in progress field and filter. 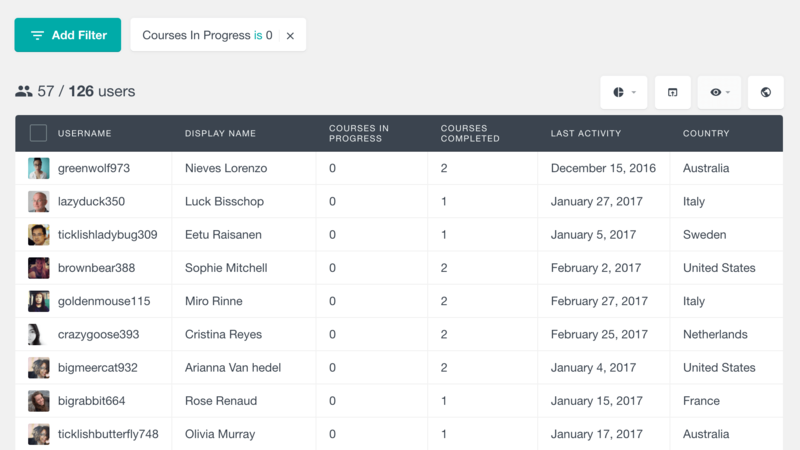 This field shows how many courses each student has currently in progress, excluding the completed courses. The following example illustrates how to find all the students who have no courses currently in progress. If you want to take this one step further, you can combine this filter with the “Courses Completed” filter. In this way you can, for example, find all the students who have never enrolled in any course. 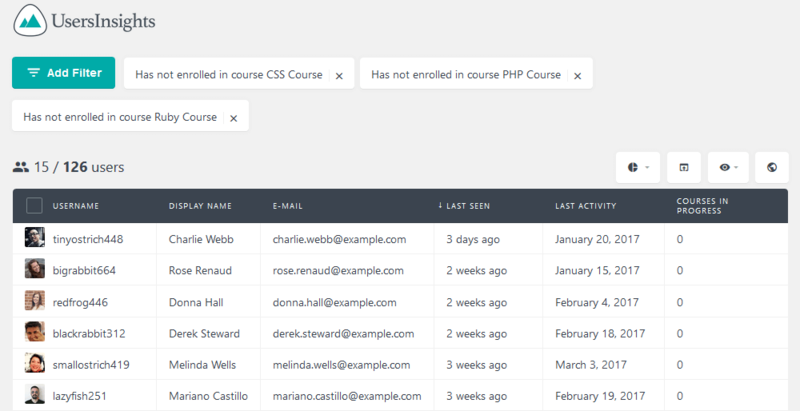 It’s also possible to extend this filtering and find out users who haven’t enrolled in multiple courses. For that just add in sequence the selected courses by using the “has not enrolled course” filter. A good tip here is also using the segments to quickly re-apply this filtering with the click of a button. 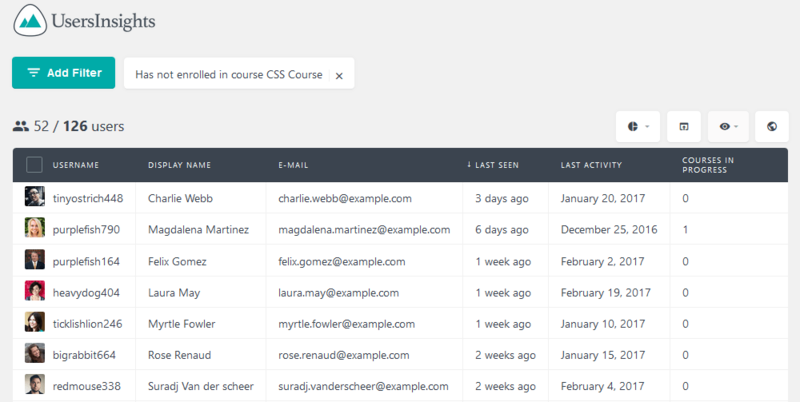 In this way, in case you check inactive users often, you won’t have to re-add the course names. Just make sure that you have the selected filters applied and then use the segment button to save them. You may also want to save this data regarding which users are inactive for future reference. In particular, if you want to know which inactive LearnDash users have turned into active users. For that, you just need to save them in a group, such as inactive. 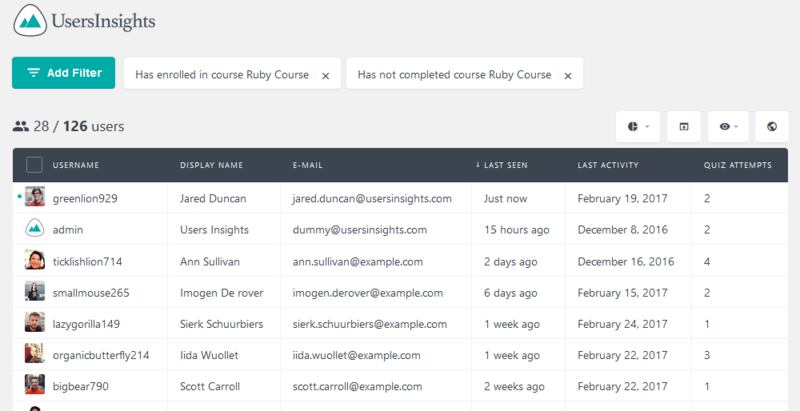 Then in the future, you can retrieve this information and compare which users have any course in progress or complete. This means that they were inactive users in the past but turned into active users. Another great way to track down user activity is finding how many users have started but not completed a course. For that we have two useful filters: “has enrolled” and “has completed”. In this way, we can find users who are still studying by filtering users who have enrolled and not completed a particular course. In combination with the activity filter, you can find out users who have potentially dropped out. This is a great opportunity to reach out to them and maybe help with any issues they are facing. You can also check the Users Insights profile for a particular user and you’ll find additional LearnDash profile information about them. In this section you can see their progression at a glance. Another way to analyze your user activity is by using the “Active students” report from the LearnDash Reports section. 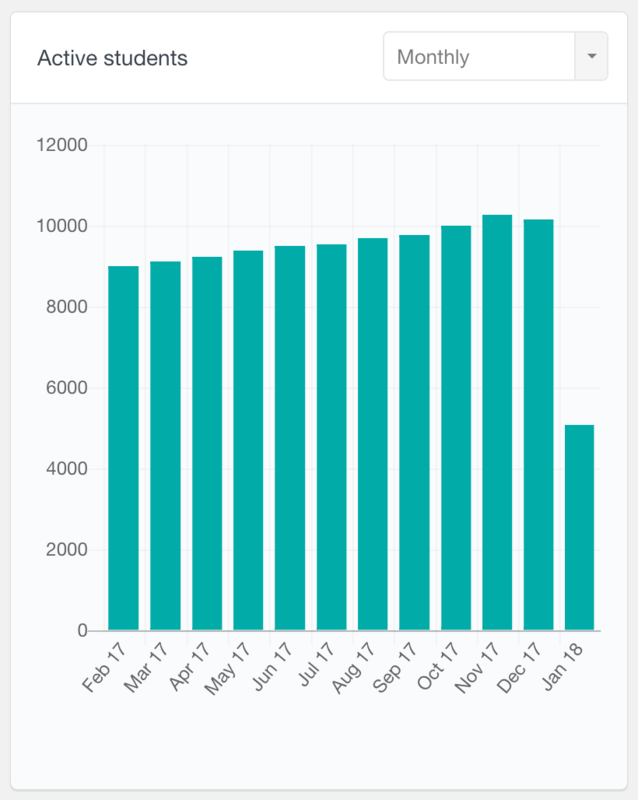 This report reflects the number of users that have engaged with your courses in any way for the past several days, weeks, months or years. 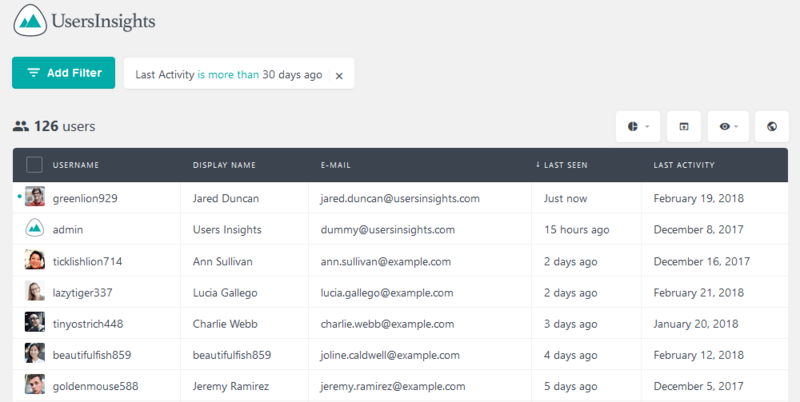 While the user table filters can show you the exact users that have not been active for a while, this report can be used to explore your user activity over time. All the information that we discussed so far is great from the management point of view. Let’s find out how you can recover inactive users. This can be done if you export them and get in touch with them via email or other methods. Today we looked into how you can find your inactive LearnDash users, by using different LearnDash filtering examples. By the end of the day, you should be able to filter your users by their activity and bring them back to your site by using email campaigns. We hope you enjoyed our article, and see you again next time!